Nova Scotia’s Litters n’ Critters was “overwhelmed” when it was asked to take in twenty-eight cats and kittens from one home; the group was struggling to find homes for cats they already had, and, as president Shelley Cunningham plaintively remarked, “There are so many cats out there.” Also in Nova Scotia, Annapolis County’s Companion Animal Protection Society celebrated its fifth anniversary while dealing with a “bumper crop” of kittens. Eight-year-old Community Feline Rescue in Manotick continued to try to deal with the village’s still-growing feral communities, while the Peterborough Humane Society took in the surviving members of a box of cats that sat at the side of a road for about five days, despite the fact that the Society has had a waiting list to take in cats for two years. Winnipeg’s Nancy Swaine applied for an excess animal permit so that she could keep twenty-six cats and foster five in her home; over the past fifteen years she’s rescued about one hundred cats from the campus of the University of Manitoba, where she works. Last Chance Cat Rescue said there were “thousands of feral cats” in Lethbridge’s industrial area, while the Lethbridge Humane Society lamented that “There’s a lot of people that simply don’t care.” The Pincher Creek SPCA announced they were at capacity, and asked that “if people want to get rid of a cat, that you hold off until the new year when hopefully we can get our cat population down,” and just over the provincial border someone tried to solve Golden’s stray cat problem by leaving antifreeze out. The Kitimat Humane Society turned into a “dumping ground”: they juggled thirty-two cats in space meant for twenty-five; in November they’d put down thirty cats when their numbers reached two hundred. Vancouver’s Orphan Kitten Rescue found itself in “dire straits”: in a typical year the group takes in around 800 cats, but 2008 was not a typical year. The scale of the problem is overwhelming. The people trying to solve it – almost all volunteers, and almost all women, incidentally – are often overwhelmed. Political leadership is virtually non-existent. And outside, where most of the cats in question live, it’s freezing cold. 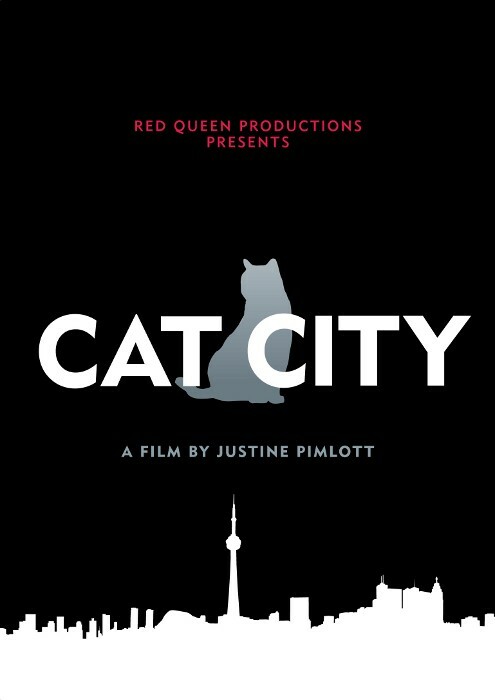 It’s the perfect time, in other words, to cozy up in front of a television and watch Justine Pimlott’s Cat City. Pimlott’s documentary looks at Canada’s cat problem as seen from Canada’s largest city, and then it does something incredible: it proposes cogent solutions. All in only fifty-four minutes, and all without sacrificing aesthetics or narrative to politics. Cat City is, first of all, a gorgeous movie. Toronto looks bad here – the city’s Animal Services alone killed 4,130 cats in 2007 – but from a misty morning on the Scarborough bluffs to a bitter winter afternoon in an empty boatyard to a series of evenings in nameless, weedy alleyways, Toronto looks great here. And no matter how scrappy or neglected, the cats look great, too. Here’s a barely five second clip: two carriers sit next to one another in the back seat of a car; we see a closeup of the one on the right, its rusty wire door lit by harsh sunlight, its interior dark; a black kitten squints in the light and gnaws on its new cage, then retreats back into darkness; the car pulls out of a parking lot, and we see the second carrier, bouncing around a bit and glowing within, the sunlight diffused by yellow and red plastic; the cat inside, wide-eyed and startlingly black and white, peers through white, widely-spaced wire bars, then looks for a place to hide. Even when her subjects aren’t cooped up, Pimlott finds ways to engage with them and to show us their world from their vantage points. The images she records are, in and of themselves, moving; in context, they’re rather devastating. There is humour in these stories. Brydges announces his plan to capture Cheshire, the last unsterilized cat in his colony; Cheshire immediately looks up from licking his balls and stares at the camera; Pimlott plays a Pink Pantheresque tune while Rob makes a pretty inept attempt to snare Cheshire with what looks like an oversized butterfly net; Shirley sits at her picnic table cracking up. And at Second Chance, Smith rejects the suggestion that she’s “eccentric”: “I haven’t got any money, only rich people are eccentric, I’m just crazy.” These stories have compelling arcs, too, and while one of them illustrates the capacity that cats have to give back to the humans that care for them, the other makes it clear that Canada’s cat problem is hurting humans, too. Ferne Sinkins, for example, has “gone through burnout about five times” since founding Toronto Cat Rescue in 1994. “People who are cat lovers live in a constant state of trauma,” she says matter-of-factly, “because what they love the most is so mistreated.” Sinkins has dedicated her “entire life” to trying to help cats; her knowledge and experience, her organizing and frontline work, constitutes the core of Cat City. She doesn’t once smile, but she does offer systemic solutions to Toronto’s problem. Pimlott describes Toronto Cat Rescue as seeking “radical change,” but the only thing radical about Sinkins’ solutions is how unambiguous and achievable they are: a bylaw that compels any group that adopts cats out to have them sterilized before they leave the premises; a bylaw that requires all owned cats to be sterilized; a low-cost spay/neuter clinic in an accessible area. Ferne’s proposals are backed up by Bill Bruce, Calgary’s director of Animal Services. Bruce is reflective – “perhaps the wisdom isn’t there yet, people haven’t learned enough about how to be a good companion to your cat” – but he, too, is absolutely clear: “because cats are such successful reproducers, you will never build your way out of this problem. Every time a new shelter gets built, within days or a week at the most, it’s full.” (Apologies to Kawartha Lakes, Durham, Vaughan, and Pembina Valley, all of whom made the news in the past month as their new shelters took shape, to the tune of approximately $3.85 million total.) In Calgary, “money from cat licensing is going directly to a free spay/neuter clinic”; the city’s goal is to empty its shelters. To that end, cat rescue groups, the local humane society, and city council are working in harmony. Canada’s cat problem, then, doesn’t have to be overwhelming. There are selfless, heroic people working to solve it. There are simple solutions readily available. It’s still freezing cold outside, but the days are getting longer. And in Toronto, there’ll be a municipal election on October 25. It’s the perfect time, in other words, to cozy up to your local candidates and ask them what they plan to do to fix Toronto’s cat problem.